EU member states' ordinary passport booklets (France shown here) have common design elements and all, except Croatia, have burgundy coloured covers. The European Union itself does not issue ordinary passports, but ordinary passport booklets issued by its 28 member states share a common format. This common format features a coloured cover (for which burgundy is recommended but not compulsory: all countries except Croatia follow this recommendation) emblazoned—in the official language(s) of the issuing country (and sometimes its translation into English and French)—with the title "European Union", followed by the name(s) of the member state, its coat of arms, the word "PASSPORT", together with the biometric passport symbol at the bottom centre of the front cover. Some EU member states also issue non-EU passports to certain people who have a nationality which does not render them citizens of the European Union (e.g., British Overseas Territories Citizens except those with a connection to Gibraltar, British Protected Persons and British Subjects). In addition, the European Commission issues European Union Laissez-Passers to the members and certain civil servants of its institutions. With a valid passport, EU citizens are entitled to exercise the right of free movement (meaning they do not need a visa) in the European Economic Area (European Union, Iceland, Liechtenstein, and Norway) and Switzerland. When going through border controls to enter an EEA country, EU citizens possessing valid biometric passports are sometimes able to use automated gates instead of immigration counters. For example, when entering the United Kingdom, at major airports, holders of EU biometric passports that are twelve years of age or older can use ePassport gates, whilst all other EU citizens (such as those using a national identity card or a non-biometric passport) and non-EEA citizens must use an immigration counter. Anyone travelling with children must also use an immigration counter. As an alternative to holding a passport, EU citizens can also use a valid national identity card to exercise their right of free movement within the EEA and Switzerland. Strictly speaking, it is not necessary for an EU citizen to possess a valid passport or national identity card to enter the EEA or Switzerland. In theory, if an EU citizen outside of both the EEA and Switzerland can prove their nationality by any other means (e.g. by presenting an expired passport or national identity card, or a citizenship certificate), they must be permitted to enter the EEA or Switzerland. An EU citizen who is unable to demonstrate their nationality satisfactorily must nonetheless be given 'every reasonable opportunity' to obtain the necessary documents or to have them delivered within a reasonable period of time. Only British and Irish passports are not obliged by EU law to contain fingerprint information in their chip. With the exception of passports issued by Denmark, Ireland, and the United Kingdom, all EU citizens applying for a new ordinary passport or passport renewal by 28 August 2006 (for facial images) and 28 June 28 2009 (for fingerprints) should have been biometrically enrolled. This is a consequence of Regulation (EC) 2252/2004 in combination with two follow-up decisions by the European Commission. Non-standard types of passports, such as passport cards (Ireland is still the only EU country to issue a passport in card format), diplomatic, service, and emergency passports have not yet been harmonised but, since the 1980s, European Union member states have started to harmonise aspects of the designs of their ordinary passport booklets. Most passports issued by EU member states have the common recommended layout; burgundy in colour with the words “European Union” accompanied by the name of the issuing member state printed on the cover. 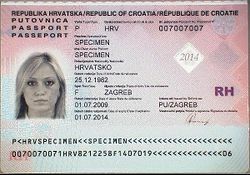 However, the newest EU member state Croatia refused to fully comply with the EU common recommended layout even though the Croatian passport has been changed in design due to the recent accession into the EU. From 3 August 2015, the new Croatian passport retained its dark blue passport cover and is the odd one out among the 28 European Union member states' passports. On the other hand, the UK Government announced plans in December 2017 to return to the dark blue cover passport after Brexit, which in 1988 the UK Government voluntarily changed the colour of the passport to burgundy red, in line with all EU passports. On the top of the identification page there is the code "P" for passport, the code (ISO 3166-1 alpha-3) for the issuing country, and the passport number. On the left side there is the photo. On other places there might optionally be a national identification number, the height and security features. Like all biometric passports, the newer EU passports contain a Machine-readable zone, which contains the name, nationality and most other information from the identification page. It is designed in a way so that computers can fairly easily read the information, although it still human readable, since it contains only letters (A–Z), digits and "<" as space character, but no bar graph or similar. 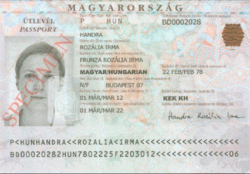 Names containing non-English letters are usually spelled in the correct way in the visual (non-machine-readable) zone of the passport, but are mapped into A-Z according to the standards of the International Civil Aviation Organization (ICAO) in the machine-readable zone. The following mapping is specified for EU languages: å → AA; ä/æ → AE; ö/ø/œ → OE, ü → UE (German) or UXX (Spanish) and ß → SS. Letters with accents are otherwise replaced by simple letters (ç → C, ê → E, etc.). For Greek and Bulgarian there are mapping tables based on translitteration into English. They use both their and Latin alphabet in the visual zone. For example, the German names Müller becomes MUELLER, Groß becomes GROSS, and Gößmann becomes GOESSMANN. The ICAO mapping is mostly used for computer-generated and internationally used documents such as air tickets, but sometimes (like in US visas) also simple letters are used (MULLER, GOSSMANN). The three possible spelling variants of the same name (e.g. Müller / Mueller / Muller) in different documents sometimes lead to confusion, and the use of two different spellings within the same document (like in the passports of German-speaking countries) may give people who are unfamiliar with the foreign orthography the impression that the document is a forgery. 50% discount exists for seriously ill applicants; 10% discount exists for applicants whose fingerprints cannot be taken and who obtain a passport valid for 1 year. Some EU countries, such as Germany, Ireland, Malta and the UK, allow their citizens to have several passports at once to circumvent certain travel restrictions. This can be useful if wanting to travel while a passport remains at a consulate while a visa application is processed, or wanting to apply for further visas while already in a foreign country. It can also be needed to circumvent the fact that visitors whose passports show evidence of a visit to Israel are not allowed to enter Iran, Iraq, Lebanon, Libya, Saudi Arabia, Sudan, Syria and Yemen (It is, however, possible to get the Israeli entry and exit stamp on a separate piece of paper). Each EU member state can make its own citizenship laws, so some countries allow dual or multiple citizenship without any restrictions (e.g. France, Ireland, Italy, Sweden, the United Kingdom), some regulate/restrict it (e.g. Austria, Germany, the Netherlands, Spain), and others allow it only in exceptional cases (e.g. Lithuania) or only for citizens by descent (e.g. Croatia, Estonia, Slovenia). A citizen of an EU member state can live and work in all other EU and EFTA countries (but not necessarily vote or work in sensitive fields, such as government, police, military where citizenship is often required). Non-citizens may not have the same rights to welfare and unemployment benefits like citizens. Decision 96/409/CSFP of the Representatives of the Governments of the Member States meeting within the Council of 25 June 1996 on the establishment of an emergency travel document decided that there would be a standard emergency travel document (ETD). ETDs are issued to European Union citizens for a single journey back to the EU country of which they are a national, to their country of permanent residence or, in exceptional cases, to another destination (inside or outside the Union). The decision does not apply to expired national passports; it is specifically confined to cases where travel documents have been lost, stolen, destroyed, or are temporarily unavailable. clearance from the authorities of the applicant's country of origin has been obtained. As a consequence of citizenship of the European Union, when in a non-EU country EU citizens whose country maintains no diplomatic mission there, have the right to consular protection and assistance from a diplomatic mission of any other EU country present in the non-EU country. Like passports issued by EU member states, passports of other EEA states – Iceland, Liechtenstein, and Norway – as well as of Switzerland, can also be used to exercise the right of free movement within the European Economic Area and Switzerland. Passports and travel documents issued by member states shall comply with minimum security standards, and passports must incorporate a storage medium (a chip) that contains the holder's facial image and fingerprints. This obligation does not apply to identity cards or to temporary passports and travel documents with a validity of one year or less. Iceland, Norway, Switzerland, and Lichtenstein are bound by the rules (while the United Kingdom and Ireland are not). ^ All EU issuing nations make a concerted effort to ensure that their passports feature nationally distinctive designs. Finnish passports make a flip-book of a moose walking. The new UK passport launched on 3 November 2015 features on pages 26-27, Shakespeare's Globe Theatre with architectural plans as well as performers on stage. Each UK passport page is completely different from all the other pages and from all the other pages of other EU passports. ^ a b "Resolution of the Representatives of the Governments of the Member States of the European Communities, meeting within the Council of 23 June 1981". ^ a b "Council Regulation (EC) No 2252/2004 on standards for security features and biometrics in passports and travel documents issued by Member States". ^ European Council regulations covering the issue of EULF documents, dated 17 December 2013, accessed 11 October 2016. ^ Decision of the EEA Joint Committee No 158/2007 of 7 December 2007 amending Annex V (Free movement of workers) and Annex VIII (Right of establishment) to the EEA Agreement, EUR-Lex. Retrieved 24 November 2015. ^ "UK Border Agency: Using e-passport gates". Ukba.homeoffice.gov.uk. 5 March 2014. Retrieved 10 March 2014. ^ "Entry clearance basics (entry clearance guidance) - GOV.UK". ^ "UK Visas and Immigration". gov.uk. ^ Anonymous (6 December 2016). "Document security - Migration and Home Affairs - European Commission". ^ "Croatian Passport the 'Blue' Sheep of the 'Burgundy' EU Family". CroatiaWeek. 15 February 2016. Retrieved 15 August 2017. ^ "Blue passport to return after Brexit". BBC News. 22 December 2017. Retrieved 22 December 2017. ^ "Document: FIN-AO-06001". Retrieved 24 November 2018. ^ "HELP.gv.at: Reisepass – Neuausstellung". help.gv.at. Retrieved 2 August 2017. ^ "Council of the European Union - PRADO - AUT-AO-02002". consilium.europa.eu. Retrieved 2 August 2017. 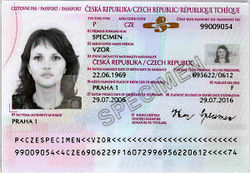 ^ "Osobní doklady" [Personal identification documents] (in Czech). Ministry of the Interior of the Czech Republic. 31 May 2017. ^ "Service prices 1st January 2018 - Local police service prices - Travel documents, identity documents and personal identification". Poliisi.fi. 1 January 2018. Retrieved 21 January 2018. ^ "Council of the European Union - PRADO - FIN-AO-05002 - <Outside front cover>". ^ "Il Rilascio". Poliziadistato.it. Retrieved 29 August 2014. ^ "Passaporto per i minori". Poliziadistato.it. Retrieved 10 March 2014. ^ "Ministero degli Affari Esteri - Documenti di Viaggio - Passaporto". Esteri.it. Retrieved 10 March 2014. ^ DELFI (29 January 2015). 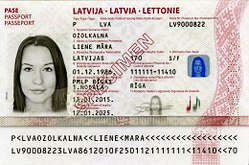 "Jaunā parauga Latvijas pilsoņu pases dizainu izstrādājuši PMLP speciālisti un vācu dizaineri". ^ "Paspoort wordt 10 jaar geldig". Rijksoverheid.nl. 28 September 2012. Retrieved 10 March 2014. ^ a b c "Passport fees - GOV.UK". www.gov.uk. Retrieved 18 April 2018. ^ a b "Get an emergency travel document - GOV.UK". www.gov.uk. Retrieved 18 April 2018. ^ "The Henley Passport Index" (PDF). Henley & Partners Holdings Ltd. 8 January 2019. Retrieved 8 January 2019. This graph shows the full Global Ranking of the 2019 Henley Passport Index. As the index uses dense ranking, in certain cases, a rank is shared by multiple countries because these countries all have the same level of visa-free or visa-on-arrival access. ^ "Emergency travel document (ETD)". EUR-Lex. European Union. Retrieved 30 November 2015. 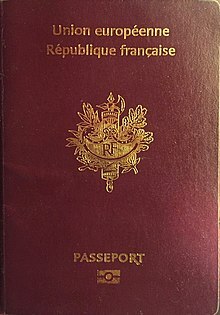 Wikimedia Commons has media related to European passports. This page was last edited on 20 April 2019, at 12:25 (UTC).